Stupid-long race is created by some cray-cray race director. I think said race is ridiculous, even by my standards, and declare myself uninterested. My friends comment on how said race is ridiculous...ly AWESOME and they are signing up. I like my friends so I grudgingly sign up too. That's basically the first half of 2013 in a nutshell for me. See: The OGRE. Dirty Kanza. And now the latest exhibit is the Bonk Hard Hardwater 50k paddle race. The blame for this one fell squarely on my Alpine Shop teammate Carrie's shoulders since she is rehabbing a serious knee injury suffered earlier this year. Paddling is one AR discipline her doc has given her the go-ahead to do, and if you know Carrie, then you know that she is gonna paddle the crap out of some water until her knee gets better. 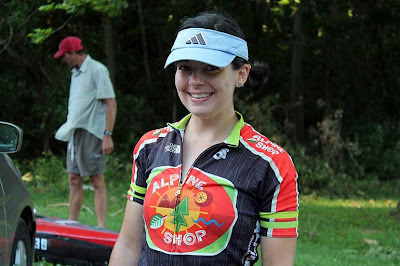 So pretty soon she was signed up for this 50k (31 mile) paddle race with her husband and fellow Alpine Shop teammate Jeff. Carrie and Jeff practicing in the rain. Love them!!! That was all well and good, but I had no interest in spending that much time on the water. 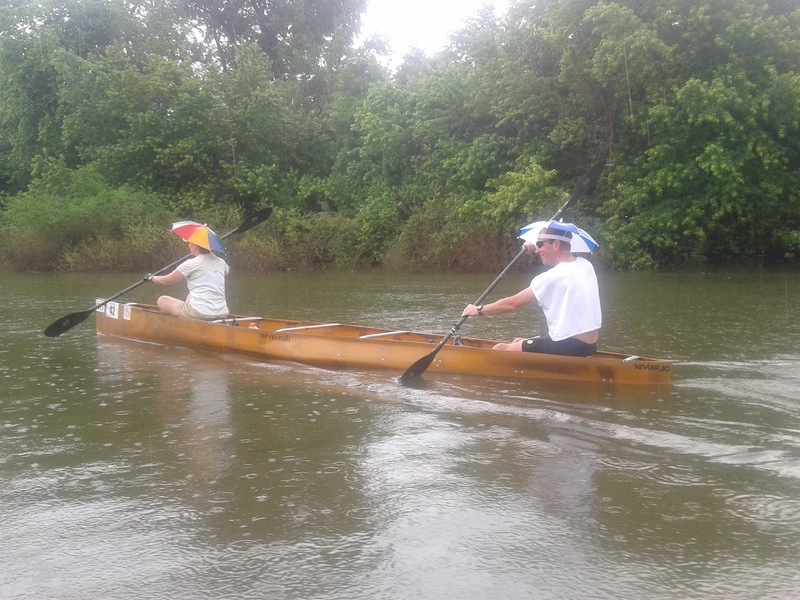 My longest paddle to date, I think, was a 20-miler during Thunder Rolls 2010 that was absolutely miserable. 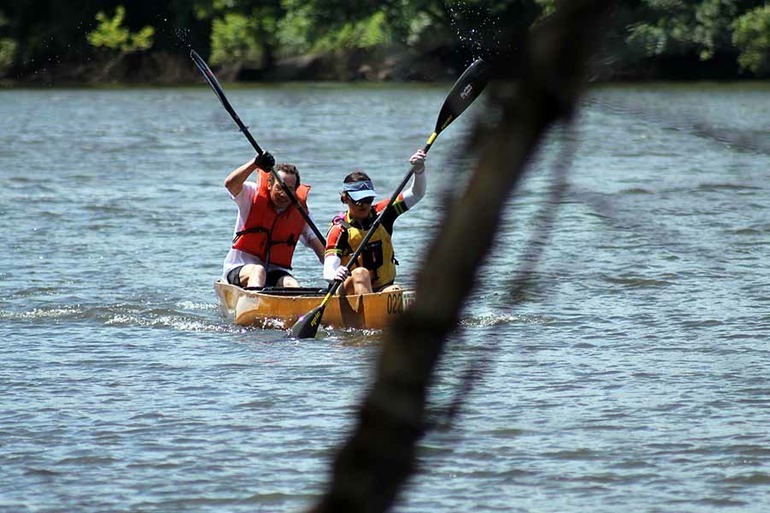 For me, and many other adventure racers, paddling is akin to swimming in a triathlon. Aside from the people who are really, really good at it, the rest of us are just glad when it's over. 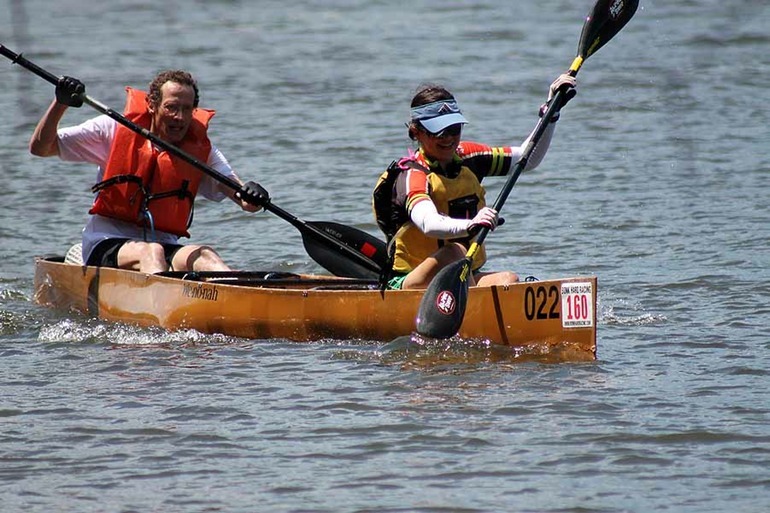 And another parallel to triathlon, it's really hard to win an adventure race on the water, but you sure can lose it. 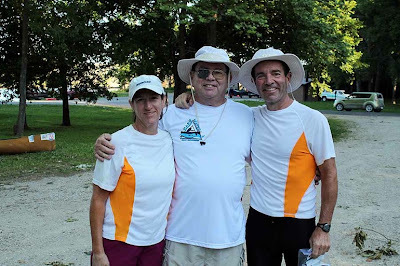 But then David got in on the act, and he had a race canoe, and he needed a partner, and I had a free race coupon from Bonk Hard and.....suddenly team "Would you like Freis and a Korsch with that?" was signed up for Hardwater! Training ensued. Jeff and Carrie found an almost-identical race canoe to borrow from another local paddler, and the four of us hit the water for some great training sessions. And to be honest, the paddling practice was certainly needed, but it was even better to have Carrie to train with. Girl is nails!! 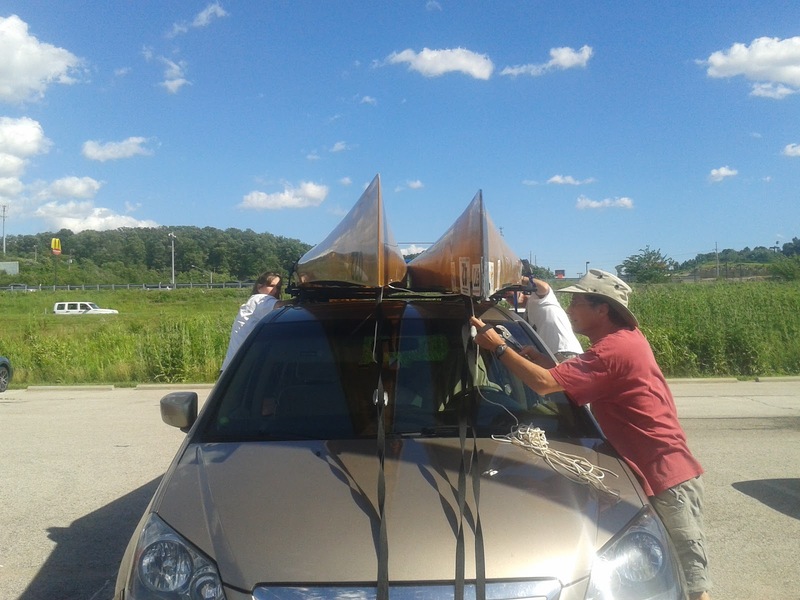 I meet up with David, Jeff, and Carrie in our favorite commuter lot and we go about securing 2 racing canoes to the top of the Sona-van, further proving that minivans are the ultimate adventure vehicle. Everything is lashed down securely and we drive over to Sullivan for a delicious Mexican meal and to pick up everyone's favorite crew chief, Leonard! Then it's a familiar drive to Lake of the Ozarks where we check into Tan-Tar-A and have a really fun, low-key evening there. Since there aren't any maps to plot, we don't have anything to stress about and it's awesome. Race morning is not even that early with a 6.30a hotel departure and a 7a arrival at the put-in. We are one of the first vehicles there and are greeted by the cutest race packets ever - mini rubbermaid bins stuffed to the gills with goodies from Bonk Hard. This year's inaugural Hardwater saw only 16 people sign up, but Bonk Hard didn't let that stop them from putting on a fabulous event. Included in our race packet were TWO shirts (short sleeved race shirt and long sleeved Columbia shirt) and a bunch of other swag items. 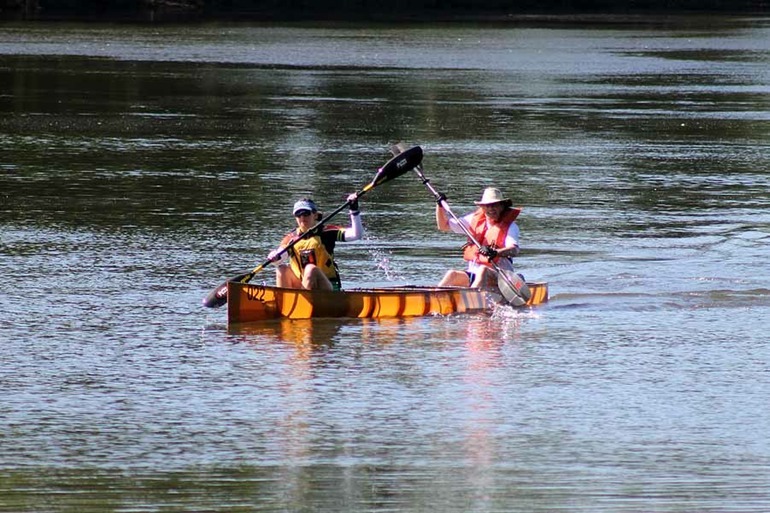 Bonk Hard really treats their racers well, especially those brave enough to try a first-year paddle-only race! We have tons of time to get ready and, besides me spraying sunscreen into my coffee, everything goes smoothly. 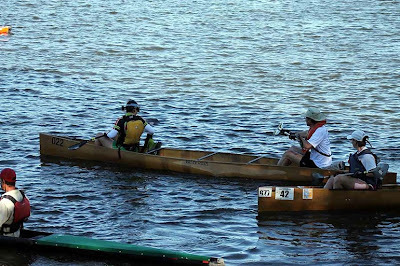 There are a couple of "real" paddlers parked next to us (indeed, they would go on to finish 1-2 in the race) and it is really cool to feel out of my league at a race. 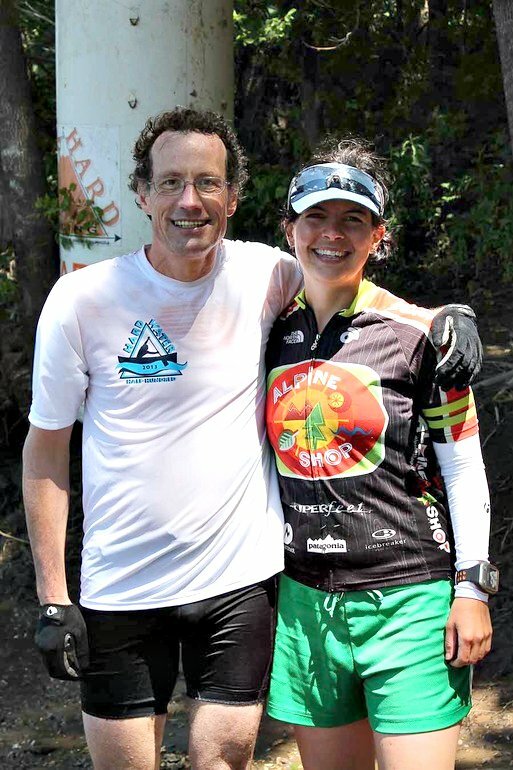 Sometimes I think people get that feeling about racing against Alpine Shop at adventure races, so I just wanted to share that I felt that same way racing against Joe and Adam! Carrie, Leonard, and Jeff! Rock stars. Uh, Carrie? The water's over there..
Me and David just before the start. Eventual winner (Joe) in red. David and I right behind, but not for long! Gary counts us down and all of a sudden...we're racing! Joe and Adam (the two guys each in full-on solo racing boats) are immediately off the front, and Jason and Diane are close behind them. Then, surprisingly, we're in fourth! I assume Jeff and Carrie are close behind so David and I just establish a good 5-hour cadence and get to work. I'm a little hot in my full-coverage PFD but pretty soon the paddle spray soaks my jersey and arm-coolers and will keep me comfortable the rest of the race. I get to work on hydration and my impromptu hose-holder works perfectly! Splits for the first 25k. After a few minutes, my Garmin beeps at me. What? I don't remember setting any alerts. But it turns out that since I'm using "Other" mode, the watch is pre-programmed to announce every mile split. Which isn't a bad idea. Actually, I think it will be helpful to keep us on track and motivated. So I tell David that we're cruising along in 7- and 8-minute miles and that is good news. 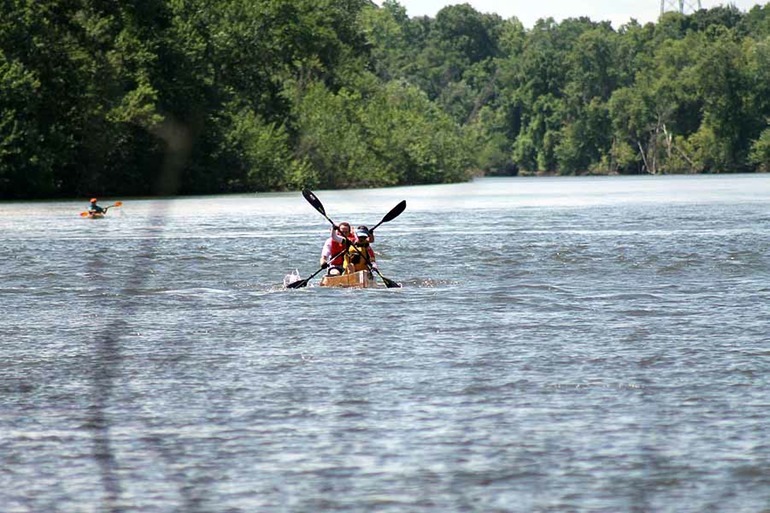 I'm not really sure where the speed is coming from; we've never gone this fast in training, but then again we train A LOT paddling upstream so perhaps the swift Osage current is taking us for a ride. No matter, it's a ride I'm happy to be on since it means less time in the boat! We're paddling along, and things are going great. Our rhythm is good, our effort is good, and our chat is good. The weather is beautiful. There are tons of birds (vultures, ducks, swallows, herons, etc.) on the Osage's banks and they make me really happy. 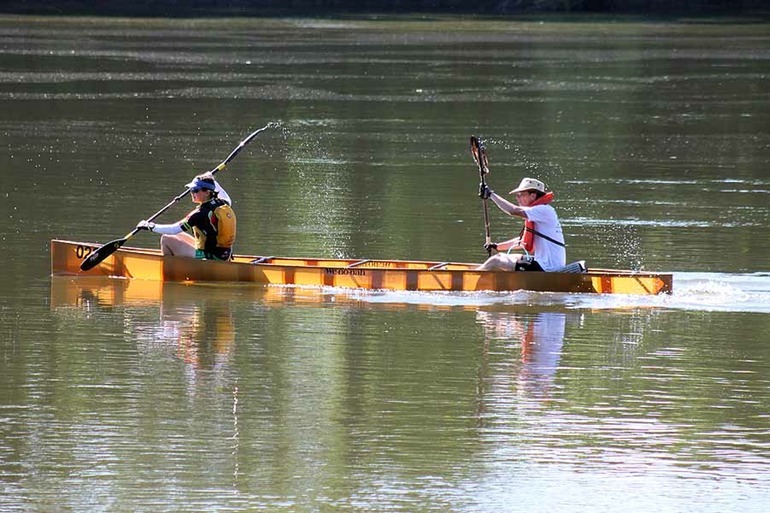 There's not really much to report here besides paddling and keeping each other happy. I'm following along on the map and pretty soon I realize that the mid-race checkpoint should be really close. Frankly, I'm surprised at how the time has flown and as we pass by the CP, we spot Leonard there with a bunch of other crew members and Bonk Hard staff. They cheer for us and we don't even stop, we're on track to crush this thing in less than 4 hours! Let's do it! Buoyed by our fast first split, David and I decide to keep things rolling for the second half. 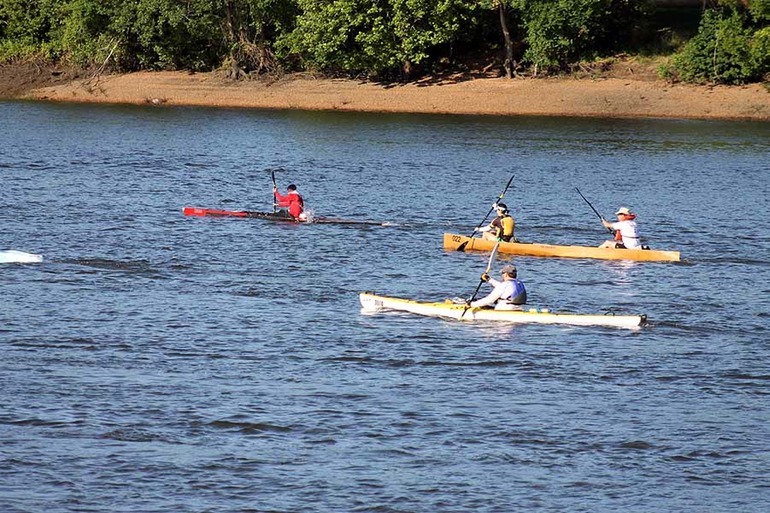 By now we're solidly in fourth - the podium spots are long up the river and we only get glimpses of 3rd place (Jason and Diane) when there's a long straight-away. We seem to have a decent gap to 5th place, who turns out to be David's nephew Nicholas in a solo kayak. So all there is to do is keep calm and paddle on. Starting the second half of the race! We're so well-fueled, in fact, that we need to pee. Now, I'm an expert at peeing during all three legs of a triathlon, but I've never peed in a boat before. Before the race, Carrie and I discussed various strategies and I was prepared with a ziplock bag (what exactly I planned to do with said ziplock I'm not sure, but I had it). Obviously we're not going to pull over to the riverbank so I have to decide what to do. David takes the lead here, telling me he doesn't care if I just pee straight in the boat because "it's mostly water anyway. There's already river water everywhere and we'll just use the self-bailer when it gets too high." He reveals that he's peed already and that gives me courage. But despite having to pee really badly, it's hard to actually go. It takes me a few miles but...finally....yeah, that happened. Approaching the finish line with Nicholas in hot pursuit! Once the pee issue is resolved, we have another obstacle to content with: the wind. We've made the final turn to the north and we are dealing with a strong headwind. At times making progress with our open boat is extremely challenging! We try to use the shoreline to our advantage as much as possible but doesn't really offer the relief we were hoping for. The best we can do, similar to Plot, Pedal, & Paddle, is just put our heads down and WORK. With about 3 miles to go, I ask David to check on Nicholas behind us and he does with a surprised yelp, "He's a lot closer than he was before! We've got to MOVE!" Competition is always fun and now we're really motivated to paddle hard. There is an island in the final mile, and we choose to go river right around it. Nicholas, only a few hundred meters back, chooses river left. We can't see each other, but we know the finish line is close, so we paddle really hard to make it around the island first. Finally, I spot the white and orange Bonk Hard finishing arch and know we've got fourth place locked up. And a sub-4 hour finish! We're thrilled with both results and are happy to cheer for Nicholas who made a great showing in his first paddle race. We can smell the finish line. And it smells like pie. 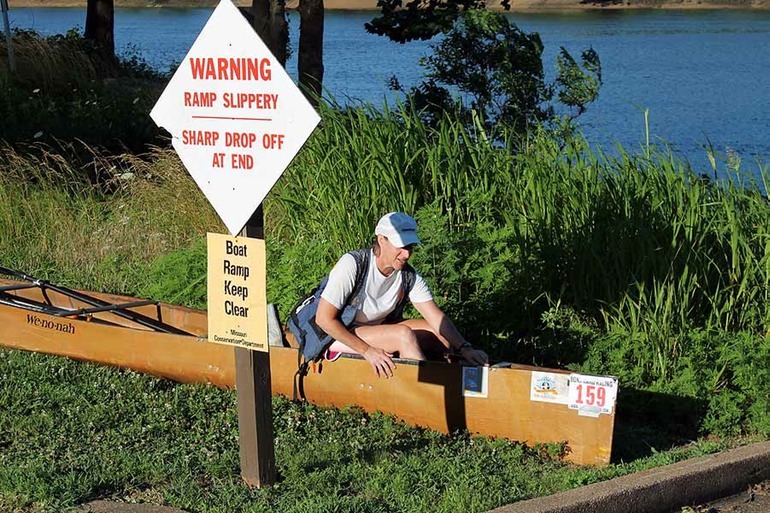 Just because there are only 16 paddlers doesn't mean Bonk Hard is skimping on the finish line party. They are armed with their traditional cowbells, plus a delicious lunch spread that includes THREE KINDS OF PIE!!!!! I am so happy. David and me: Hardwater finishers! David and I grab some food and wait for Jeff and Carrie to come in. They do, in another furious battle with a solo kayaker. They had a tough day on the water and persevered to finish really strong. Jeff and Carrie! Hardwater finishers! Hardwater was a new distance-PR for me - 30.5 miles in a boat! It was 100% downstream, which makes it much easier than most paddling experienced in adventure racing. As usual, I had a great time racing with David and spending time with Jeff, Carrie, and Leonard. 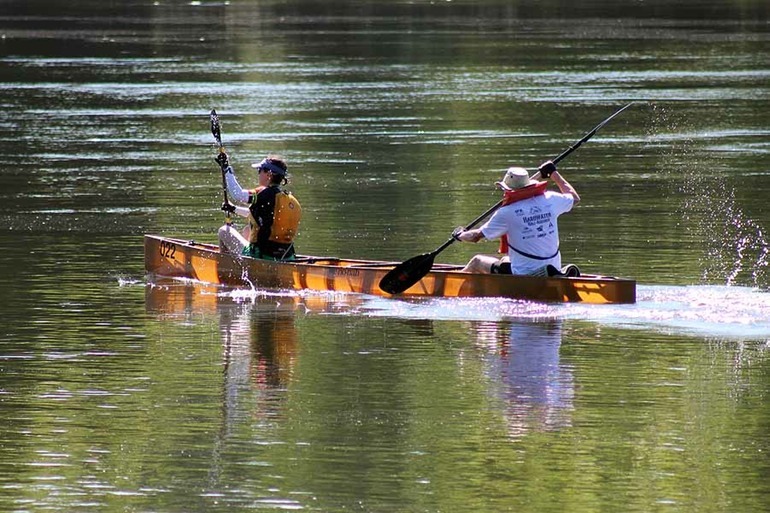 It was cool to feel like a small fish amid the other "real" paddlers that showed up to this race, and to see our adventure racing friends from Team Fusion and Orange Lederhosen. And I also appreciated the love that Bonk Hard showed us, even though it was a really small race. After everyone was finished, they had a really awesome raffle where I won a new Adventure Technology paddle! Score! Thanks also goes out to Alpine Shop for being terrific sponsors of the team and of outdoor adventure. Congrats to the finishers and paddle on!